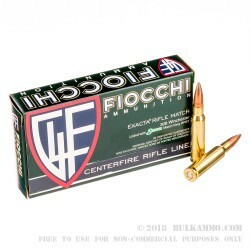 Fiocchi’s Exacta Match line of centerfire rifle ammunition is made exclusively from components crafted from the highest grade materials. 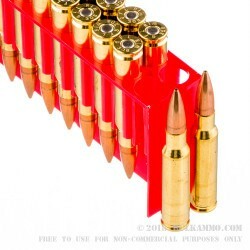 This 308 Win cartridge features a 175 grain MatchKing bullet, an extremely accurate projectile that is able to sustain a supersonic velocity even up to 1,000 yards when fired from a 308/7.62mm caliber service rifle. This bullet has a hollow point, so it will begin expanding to cause catastrophic damage upon impact. Its boat tail design increases its accuracy and ballistic coefficient, in addition to giving it some immunity against cross winds. All in all, this is a cartridge poised to perform exactly as well as your marksmanship will allow it to! 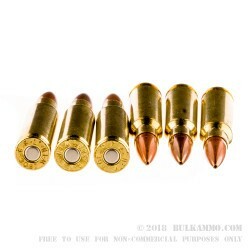 With its non-corrosive Boxer primed factory fresh brass casing, this round will continue to deliver even after you’ve brought it back home to the reloading bench. 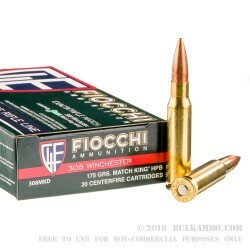 Fiocchi is one of Italy’s oldest ammunition manufacturers, and they owe that impressive distinction to just how much attention they give to each of their product’s details.